"There is a certain madness in launching into something like this," says Simon Peers. 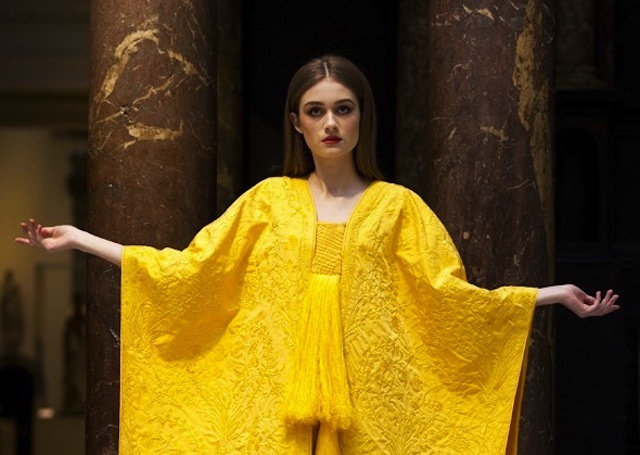 He and Nicholas Godley worked with a team of garment makers and about 1.2 million spiders to craft the V&A's latest exhibit: a shawl and cape made from spider silk. The garments took several years to make. Golden orb-weaver spiders from Madagascar were milked (silked?) daily to produce the fibres of the cloth. No dyes or treatments were employed: that striking golden colour is the natural hue of the silk. The resulting garments are both lighter and stronger than equivalents made from normal silk. You can see the remarkable fabrics at the V&A until 5 June, and there's an introductory video here. Entrance is free.